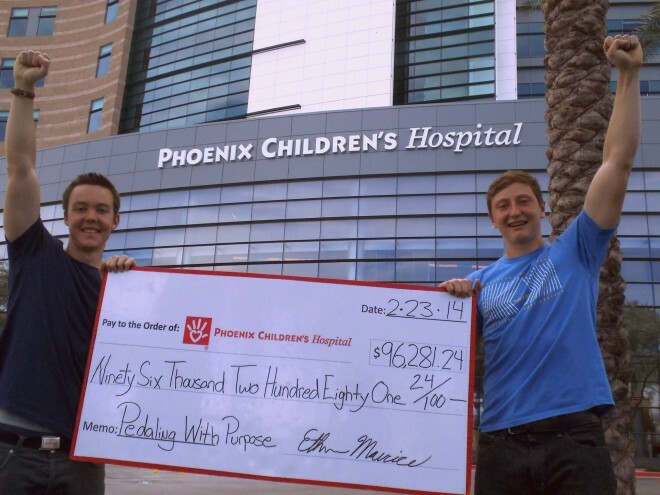 Over the summer of 2013, my brother and I raised $96,281 for Phoenix Children’s Hospital by pedaling our bicycles across the United States. No small undertaking, our 4,450 mile journey from Atlantic to Pacific took 76 days while the planning and execution of our fundraiser spanned a full year. In that year, we went from novice to expert fundraisers, learning from each success and failure along the way. Start preparing as early as possible and launch your fundraiser at least a couple months before you leave. We started planning more than 9 months in advance and launched our fundraiser three months before beginning our actual tour. The day we started riding, we had already raised $16,000. Set your fundraising goal higher than you think you can reach then stretch yourself trying to reach it. Even if you don’t hit your goal, you’ll end up raising more money as everyone from the media to donors will take your fundraiser more seriously. Everyone wants to be part of something big. The media, potential donors, and the organization you’re riding for are far more interested in a fundraiser with a $50,000 goal than a $5,000 goal. We’d never fundraised before but decided to set our goal high – at $42,330 ($10 per planned mile) which, to our amazement, we ended up more than doubling. Make your fundraiser as professional and legitimate as possible. Name it. Get a logo. Print business cards. Custom print shirts. Do a photoshoot. Shoot a promo video. Setup social media accounts. Build a donation website (the organization you’re riding for can often help you with this). Conduct your business with professional tone of voice and be upfront with your ambitions. Be confident about your goals. This professional, full package will help you get media coverage, entice large donors, and give your fundraiser the legitimacy to potentially receive inquired equipment donations. Include as many people as possible. You want people on your team, spreading the word about your epic ride for a great cause. A good friend designed our logo and organized a fundraising night at a local business. A mentor of mine raised over $120,000 for his fundraiser by riding from hospital to hospital and teaming up for a co-fundraiser with a sick child at each. Find places to speak along the way. You’re going such a great distance for your cause; people will move mountains to help if you enable them. Fund the tour yourself and make it clear that all donations go straight to the organization. Do not use donations to pay for your personal expenses. Your fundraiser will lose its credibility and have little chance at success if you take away from the very cause you’re supposed to be supporting. Feel free to ask for equipment donations, but don’t misleadingly ask anyone to donate to your cause and use the money to fund your trip. In order to raise tens of thousands of dollars, you’re going to need help from the organization you’re supporting. They usually have a large network and significantly more reach than you do. Ask them specifically what they can do to help spread the word of your fundraiser. Phoenix Children’s Hospital got us featured on local news and radio stations a dozen times. They had celebrities and professional athletes share our donation page through social media. They broadcasted our story through their social media pages and hospital newsletters. They mailed a physical donation ask letter I wrote with pictures of our journey out to thousands people in Phoenix. Without their support, our fundraiser would have only brought in a fraction of the funds. What can they do to help you help them? Tell everyone you know about what you’re doing. Email every contact you have. Post on social media. Ask your friends and family to donate and spread the word. Share your promo video with the world. Reach out to all local newspapers, magazines, radio stations, and news stations. Start marketing your fundraiser months before you begin your tour. If you get television or radio coverage, make the whole segment about driving viewers to donate. Not doing this was our biggest regret. We’d answer all the interviewers questions wholeheartedly but receive few donations from viewers of the segment. They simply didn’t catch where or how to donate. Be a politician. Answer an interviewer’s question quickly and get on to promoting your fundraiser. Repeatedly tell viewers where to donate and why they need to. If you just answer an interviewer’s questions, those watching often won’t even know how to support your fundraiser. Also, if possible, consider finishing your tour in your hometown. The media coverage of crossing the finish line with hundreds of family, friends, and fans has potential to be huge. The whole thing could be turned into a big event with emotions running high, large check donation presentations, and television interviews. Another mentor of mine bluntly told me, “Make people cry. It’s the only way to raise money.” While making people cry is not the only way to raise money, the point he conveyed is vitally important. When it comes to driving donations, emotion is stronger logic. We rode for the hospital that saved my life. A mosquito bite gave me a rare viral infection that ended up causing a stroke, put me in a coma, and left me with significant brain damage. I went through rehab at the hospital and the ride was my way to thank them for saving my life. It was this emotional comeback story that made our fundraiser stand out. It doesn’t have to be a sad story or your own personal story, but make an emotional appeal with your fundraiser. Emotion wields tremendous strength. You’re going to pedal across vast, open country and cover such long distances that most people can’t even conceptualize… on a bicycle. Everyone loves to follow along and live vicariously though such journeys. Provide a means of follow along. Whether you post video clips, keep a blog, or update a social media page regularly, some form of content is necessary to keep everyone interested and to grow your following. I blogged daily and had hundreds of followers who religiously read my daily posts. Writing the blog and editing pictures every day was time consuming and incredibly difficult to keep up with though. Be careful about giving yourself too much responsibility in this department. A successful fundraiser requires hundreds, if not thousands, of hours of investment. If the fundraiser is an excuse to head out on a bicycle tour, don’t bother. Go fully enjoy the open road! However, if you have a cause that you would find immense satisfaction contributing to, go for it. I felt such a sense of purpose and drive working on our fundraiser. I was alive and empowered. Whether I was dropping 5,000ft in elevation off the Cascades or sending out donation ask emails for custom stickers, it didn’t matter. I was on a mission. If you’re going to do a fundraiser, do it with love and passion. I had a couple mentors whose foresight and knowledge kept us on track, and I’d happily return the favor. If you need some advice on your fundraiser or have any questions, feel free to contact me through my website: www.thelivingtheory.com. 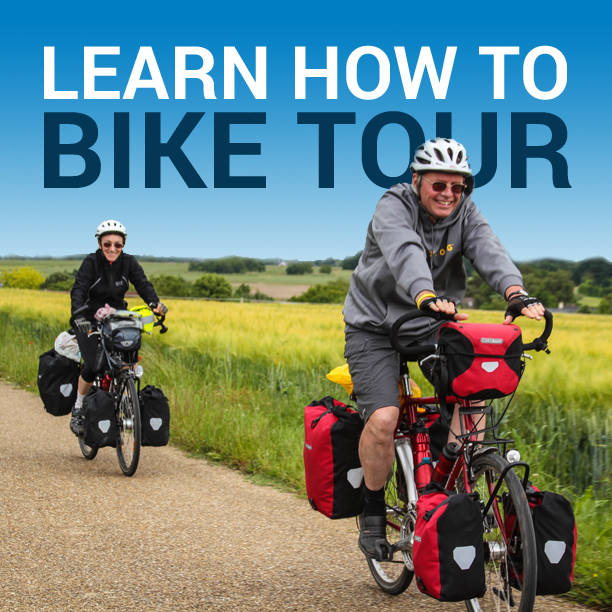 This entry was posted in Bicycle Touring Pro Articles, Featured Articles, Featured How-To Articles, Guest Posts, Main Articles, Planning and tagged adventure cycling fundraiser, bicycle tour fundraiser, bike tour, bike tour fundraiser, ethan maurice, fundraise, fundraiser, how to fundraise with a bike tour, raise funds, successful bike tour, successful fundraiser.